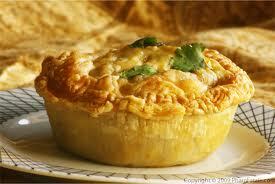 This is one of the basic skills necessary to become a good cook. Learn this and you are on your way to greatness. Why, you ask. Because I told you to…. Oh, sorry I digressed to my teen years and flashed on my father. I’m thinking that we all should be able to make a killer pie crust from scratch with out looking at a recipe in case we are unexpectedly on a cooking show? No, how about, because it is way better than store bought dough in a tin pan and scratch pie crust “makes” a pot pie great, or a cherry pie amazing, or a hot apple pie melt in your mouth. But I’m going to go with “Because I told you to…..
Are you used to your pie crust tasting like freezer burn? Does it crumble into tiny pieces when you touch it with a fork? 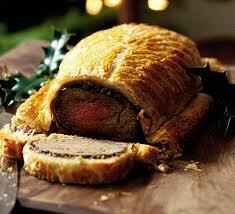 Is it the last thing sitting on every one’s plate? 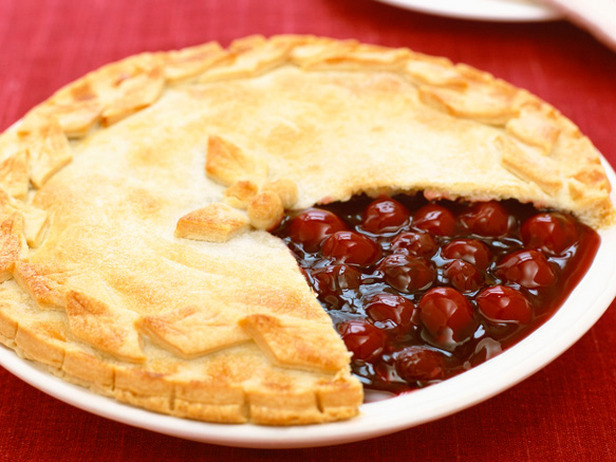 If you answered yes to any of these then you have been using store bought pie crust. 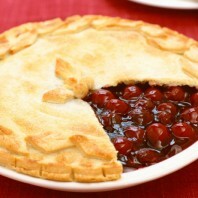 Your crust should be flakey not dry and it should melt in your mouth and enhance the flavor of your pie. 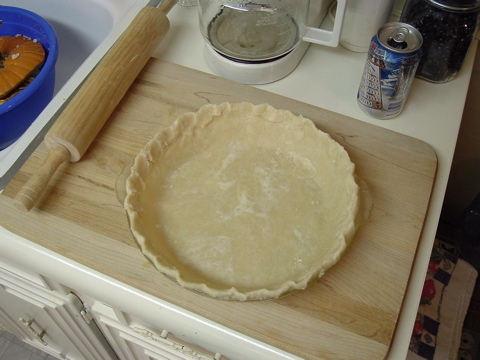 If you are thinking that every attempt you’ve made at your own pie crust has turned out tasting like cardboard, then you are trying too hard. 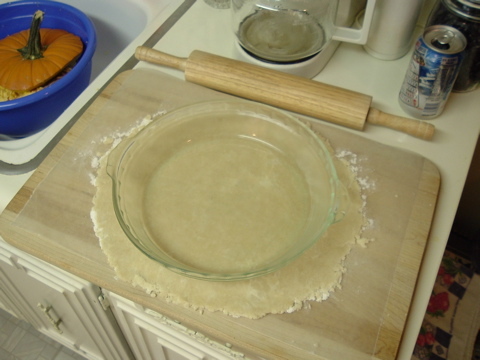 Pie crust is only flour, butter, salt and water. The rest is up to you. 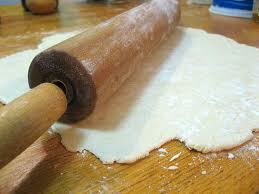 The only way to screw this up is by overworking the dough or using ingredients that are too warm. 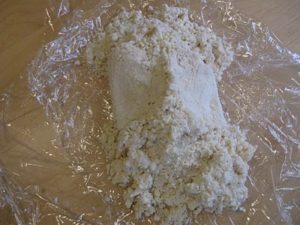 side bar – flour by its very nature contains a protein called gluten. When the flour gets wet with any liquid, those glutens link together to form chains. Those chains are great when you make bread because the more you work the dough, the more chains of gluten proteins are formed and those chains trap gases in the dough making it rise during cooking. Bread flour has even more gluten in it making the bread dough rise more easily. We don’t want our pie crust to rise at all. 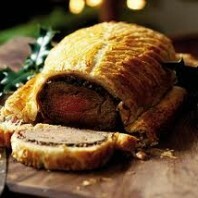 We want it to be flaky and tender, not chewy and soft. So…… don’t work the pie dough more than it takes to mix it together. 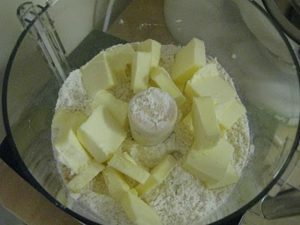 The butter – If you bake, you might soften your butter before you incorporate it into the batter. DO NOT soften the butter with a pie crust. In fact you want your butter as cold as you can get it and still cut it. I have been known to slice my cold butter then put it in the freezer before cutting it into small bits that I barely distribute by mixing thought out the dough. 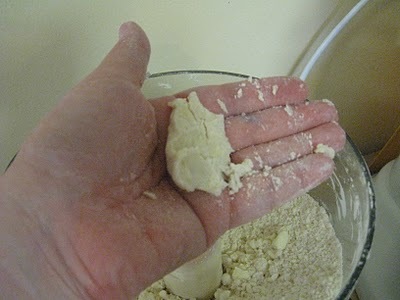 Your pieces of butter should look like small yellow peas in the flour. These pieces of cold butter will melt and expand when cooked to make your pie crust flaky. So chill all of your ingredients and the bowl before making your dough. 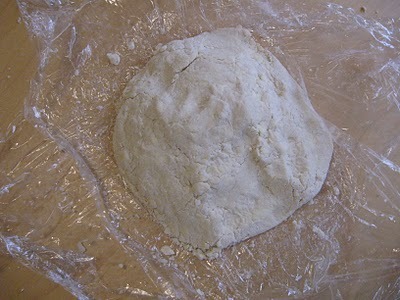 Wrap the dough ball in the plastic tightly and put it in the refrigerator for 30 minutes or more. 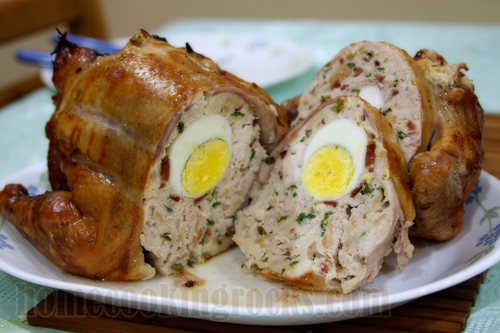 In the following video the recipe is a little different from mine above. I don’t use sugar and I use more butter. 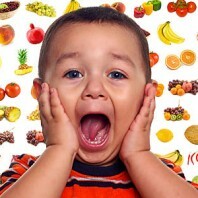 Are 500 calories of veggies equal to 500 calories of ice cream? Calories are a measure of food energy. In fact there are many different definitions and measurements of calories, but the accepted definition we are looking for is – “the amount of heat it takes to raise 1 measured weight of water 1 degree Celsius. 1 gram of water would be a small calorie and 1 kilogram would be a large Calorie. To determine how many calories are in a certain food, scientists used to set the food on fire and see how much it warmed a measured container of water. Now the calorie count is estimated from its carbohydrate, protein and fat content, with each gram of carbohydrate and protein being 7 calories and each gram of fat being 9 calories. The Calorie we see on our food labels is a large Calorie or the amount of heat it takes to raise one kilogram of water 1 degree Celsius. Since none of us have a burner in our belly, our bodies have to convert energy by chemical reactions, mostly oxidation of the carbs, protein and fat we eat. Calories in = Calories out? Not so much. Take carbohydrates. For every 100 calories of carbs you eat, the body uses 5-10 calories just to digest them. The difference being 5 and 10 is the difference between complex and simple carbohydrates (remember the Glycemic Index?) It takes us less calories to break down fat in our body. But look at protein. 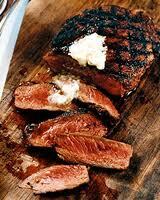 The body needs 20 to 30 calories to process each 100 grams of the protein we eat. Sure, exercise is a great calorie burner, but you need calories to burn more calories. Exercise will burn no more than 30 percent of the calories you consume. Again your body is going to help you burn calories. 60 to 70 percent of the calories we burn are to fuel normal body function like breathing, tissue replacement, blood movement, etc. Then walking, turning your head, lifting your leg, etc, help tremendously. Take the stairs, not the elevator. You get the idea. Diet foods are way more dangerous to our bodies than normal, healthy food. 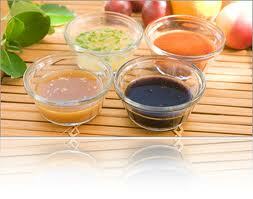 In diet foods, sugars are often replaced by chemicals like sucralose, aspartame or HFCS. Men’s Health says that a study at the University of Texas found that consuming as few as three diet sodas a week increases the chance of obesity by more than 40 percent. At Purdue in 2008 a study showed that rats that ate artificially sweetened yogurt eat more calories at subsequent meals. Eat the real deal and read the label. 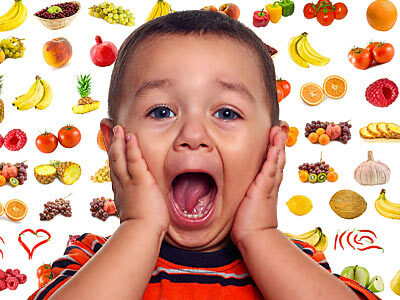 Are 500 calories of veggies equal to 500 calories of ice cream? You should now be able to answer that question yourself. 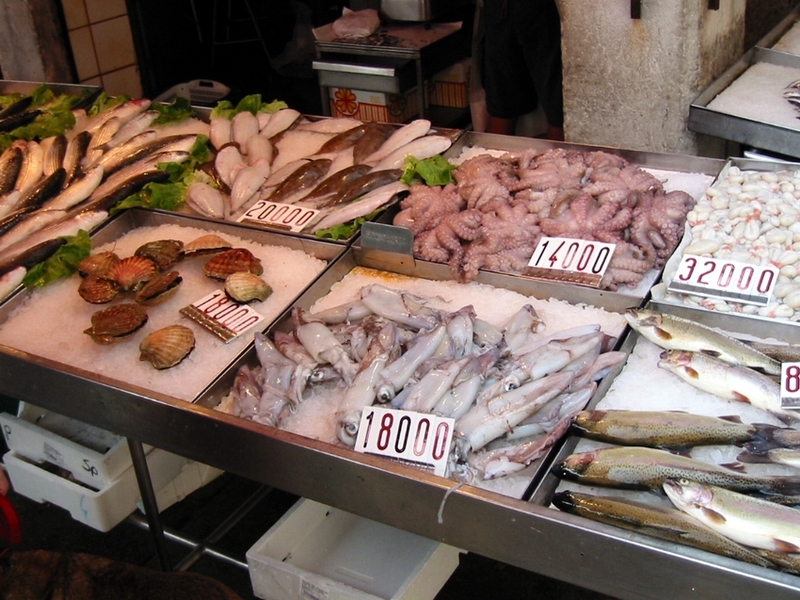 Most of us are aware of the chemicals and polutants found in the flesh of many of the sea foods we are offered at the store. 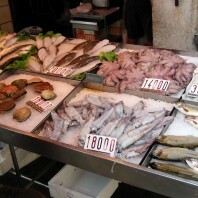 But do you know that there are still many “super green” fish and shellfish that we should and can be eating? What do I mean by “Super Green”? First of all a SG food must be healthy, and sustainable. “Farming” or raising these food sources must also be good for the environment and not add to the problems we already face with depletion of our natural resources. Albacore Tuna that is Troll or Pole Caught in the U.S. or British Columbia – This fish is only SG if it is troll or pole caught because these methods catch fish smaller than 20 lbs which have a lower continent of mercury and are caught in the colder waters of the US or British Columbia making them higher in omega 3. The hard part is how to determine if the fish you are looking at meets those standards. 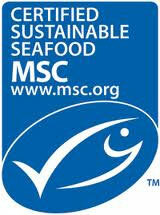 Read the labels or look for Blue Eco Label of the Marine Stewardship Council (MSC). Mussels and Oysters that are farm raised – These shellfish pack a large amount of omega-3s and oysters are high in iron. But what makes these SG are that they both feed off the natural nutrients and algae in the water, filtering the water, thus improving water quality. It is more healthy to eat these shellfish cooked as the raw shellfish, especially from warm waters may contain harmful bacteria. Pink Shrimp ( wild-caught in Oregon) and Spot Prawns (wild-caught in British Columbia) – Again, look for the MSC-certified Blue Label sticker. The U.S. has strict regulations about net caught anything. The reason being is that nets drag the ocean floors and damage the coral ref which are the habitats of most of the oceans fish. The best source of shrimp would be from Oregon and the Pacific Northwest where the shrimp are caught in traps Avoid imported shrimp, farmed or wild net caught. Rainbow Trout (Farmed) – I know it is hard to remember that one farmed fish is bad and another good but again, look for the blue label. Lake trout are available in some parts of the country but they are very high in contaminants. Almost all trout you’ll find in stores will be rainbow trout which are raised in freshwater ponds and protected from contaminants being fed a fishmeal diet designed to conserve resources. Salmon (wild-caught in Alaska) – Salmon in Alaska are very well managed. Their numbers are tracked and monitored to keep from over fishing during a particular season. Also the natural streams the fish spawn in are checked regularly. 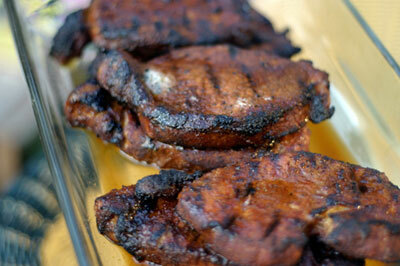 These fish are a great source of omega-3s and have very few contaminants. Avoid at all costs the farm raised salmon because the pens they are raised in are full of parasites that threaten the entire salmon population, wild and raised. Sardines (Pacific – wild caught) – Here is one you might not have thought of. Sardines have more omega-3s than salmon or tuna and are high in vitamin D. They reproduce quickly and therefore are sustainable with the new regulations. Chilean Sea Bass (also marketed as Patagonian Toothfish) –the sea bass has been prized on menus for years. That is one of the problems. These fish can live over 50 years but are very slow to reproduce, thus making them easy to over fish. There is only one well-managed fishery the is MSC-certified. Look for the blue sticker. Grouper – These are huge, delicious fish that live to be very old. Because they live so long they are high in mercury and are also on the EDF health advisory list. Monkfish – this is one of my favorite fish. 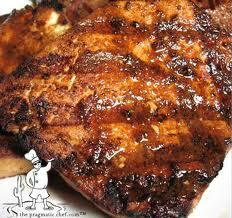 It used to be cheap and was marketed as imatation crab and lobster because its texture resembles lobster. Alas, it too became popular and is now over fished. Monkfish is making a come back because of strict netting regulation, so look for the MSC label. Salmon (Farmed) – as I explained before, the farm raised salmon are raised in pens in the ocean and are tightly packed. These pens are treated with antibiotics and full of salmon threatening parasites. Farmed raised salmon are on the EDF list also. These are all fish that are either over fished are high in contaminates or both. 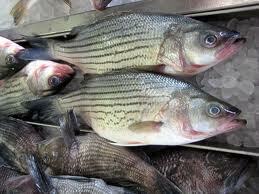 Go to The MSC certified “fish to eat” page to see pictures and updates on the available seafood. Now I’ll do a little research and see just what Tofu really is and how to make a meal out of it. 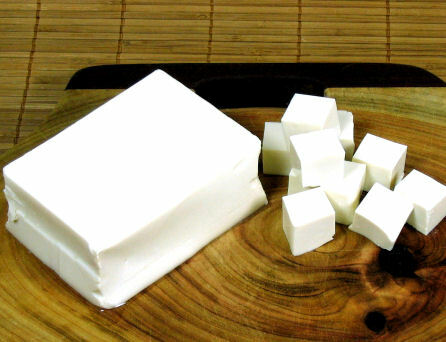 Wikipedia says “Tofu or bean curd is a food made by coagulating soy milk and then pressing the resulting curds into soft white blocks.” – I was almost right. 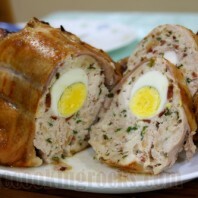 It is very high in protein. 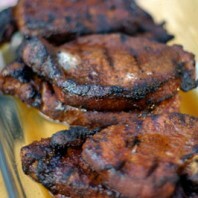 In fact 1/2 cup has 10.1 grams of protein where men should have a daily intake of 56 grams. and that same 1/2 cup only has 94 calories. Compare that to beef- 100 calories of tofu has 11 grams of protein and 100 calories of beef only has 8.9 grams of protein and the same amount of cheese has only 6.2 grams. One more thing. 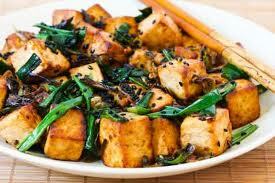 1/2 cup of tofu contains 5 grams of fat where 4 oz of beef contains 15 grams of fat. 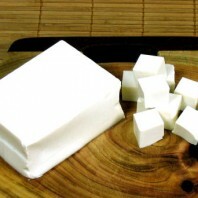 And Tofu is cholesterol-free – Info comes from here. I’m finding that a 12.3 oz package of tofu (about 3/4 lb) is about $1.80 and a pound of cheap ground-beef is at least $2.50 per pound making Tofu a little cheaper than beef. What the heck to do with it? Buy flavored tofu if you are looking for a specific flavor, like bacon tofu.